The largest of the Canary Islands, Tenerife boasts a rich variety of scenery and attractions, from lively resorts and volcanic beaches in the south to the lush interior of the Orotava Valley and the stunning lunar landscapes of El Teide National Park, dominated by 12,000 foot snowcapped Mount Teide, Spain's highest mountain. The historic capital, Santa Cruz, is in the north. 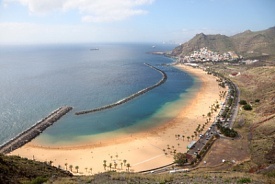 The Port of Santa Cruz de Tenerife is approximately a half hour from the Tenerife Norte Airport. Exit the airport and head northwest. Take the roundabout's 3rd exit onto Camino San Lazaro, then take the next roundabout's 1st exit onto TF-5 to La Laguna/Santa Cruz. Drive 9km on TF-5, then continue on Calle la Salle/Calle Puerto/Av Maritima/Tres de Mayo/TF-5. Keep right to turn slightly right onto Av. Manuel Hermoso Rojas, then use any lane to turn left onto Av la Constitucion, then turn right. At the roundabout, take the 1st exit and drive 5.5km until you reach the roundabout in which you take the 1st exit onto Calle Dique del Este, and you will reach your destination.